Sustainably managed forests hold vast potential to play a decisive role in ending hunger, improving livelihoods and combating climate change. 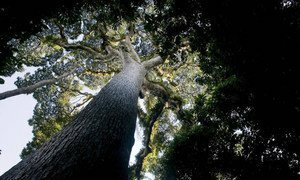 The 14th World Forestry Congress concluded today with a declaration setting out a vision for 2050 that sees forests playing “a decisive role” in ending hunger, improving livelihoods and combating climate change, said the United Nations Food and Agriculture Organization (FAO). The Congress “underlined that forests are critical to achieving the 17 Sustainable Development Goals (SDGs) in a message to the United Nations Sustainable Development Summit, which will meet later this month in New York to adopt the 2030 development agenda,” FAO said in a news release. The message says that SDG 15, which addresses the need to sustainably manage forests, trees and forests, is key to achieving several of the other goals, including those related to ending poverty, achieving food security, promoting sustainable agriculture and ensuring sustainable energy for all. World Forestry Congresses have been held under the auspices of FAO since the establishment of the Organization in 1945. After a weeklong meeting in Durban, South Africa, the Congress also issued a message to the Conference of Parties to the UN Framework Convention on Climate Change (UNFCCC), set to meet in Paris in December 2015 to hash out a new global climate change agreement. “Climate change poses a serious threat to the planet, forests and forest-dependent people. However, at the same time, countries’ responses to climate change can present new opportunities for forests, such as additional sources of financing and greater political support for forest governance,” the message says. In addition, Congress participants recommended a set of actions that include increasing understanding among governments and other stakeholders of both the challenges and opportunities that climate change presents. While saying that world’s forests must be recognized as “more than trees,” the so-called Durban Declaration adopted today drew attention to the fact that forests hold vast potential to play a decisive role in ending hunger, improving livelihoods and combating climate change. “The declaration reflects the extremely rich and diverse set of viewpoints and experiences of all participants in the Congress, who recommended ways to make the vision a reality,” said Tiina Vähänen, Deputy Director of FAO’s Forest Assessment, Management and Conservation Division. The Congress also saw the launch of an international five-year forests and water action plan to recognize the role of trees and forests in maintaining the water cycle, and to ensure appropriate management of one of the world’s largest sources of freshwater. Almost 4,000 delegates from 142 countries attended the Congress, including representatives from civil society, intergovernmental organizations, non-governmental organizations, universities and the private sector as well as around 30 ministers and deputy ministers. The Congress is held every six years, and this year’s event was hosted by South Africa with technical support from FAO and marked the first time the gathering was held on African soil since its inception in 1926. While the world's forests continue to shrink as populations increase and woodlands are converted to agriculture and other uses, over the past 25 years, the rate of net global deforestation has slowed down by more than 50 per cent, the United Nations Food and Agriculture Organization (FAO) said in a report published today.